At the Midwest Gaming Classic 2015, the Event has gotten so big that the Vendors area has migrated into it’s own large space, outside of the hotel inside a “temporary structure” (don’t call it a tent!). Bands, air hockey tables, board games, and more converged upon lots of different vendors. 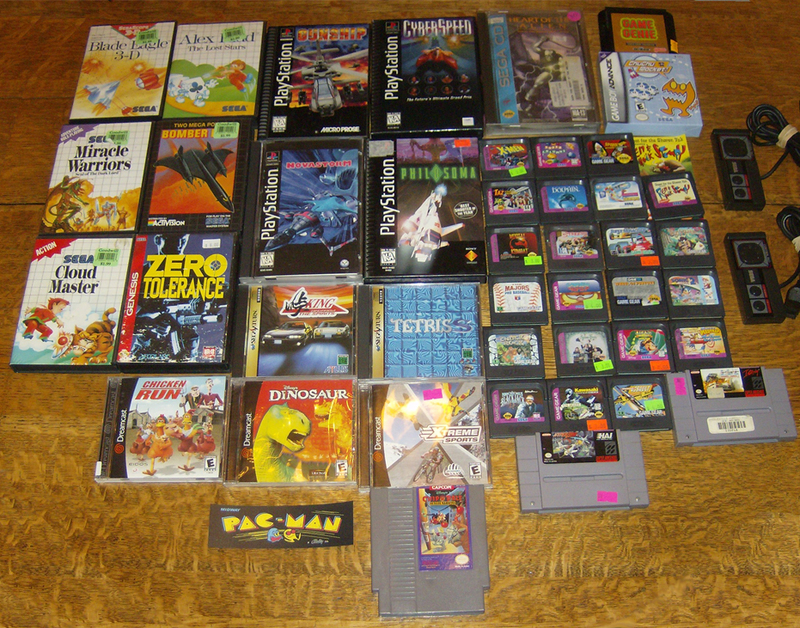 items, and deals to be found and had, so much so that a special April Collection: MGC Edition Recap was warranted. Onward, we traverse, into the marketplace. Master System games at the Brookfield, Wisconsin Goodwill on the drive up. 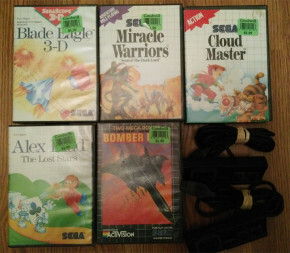 Found Blade Eagle 3-D, Miracle Warriors: Seal of the Dark Lord, Cloud Master, Alex Kidd: the Lost Stars, Bomber Raid, and 2 controllers at $2 each. Didn’t see the console around anywhere and didn’t have time to stop again on the way home to see if it had shown up, but with 8000+ like-minded people in the area it wouldn’t have lasted anyway. None of the games had the manuals, unfortunately. Always gotta snag some Playstation Long Boxes when I see them cheap. Gunship, Cyberspeed, and Novastorm were a package deal from the same vendor $14 for those three, and Philosoma was $10 from another vendor, with no manual. Early Playstation definitely had the best packaging for console games. 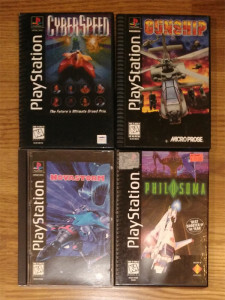 Definitely looked the coolest on the store shelves to 10 year old me, compared to the giant plastic jewel cases that Sega CD and Saturn had (and Playstation eventually used, booooo). Sad they eventually switched to jewel cases, but probably a smart decision economically. 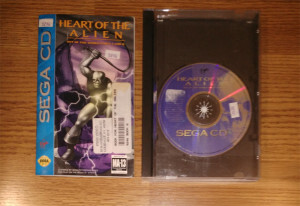 $30 for Heart of the Alien on Sega CD. It was a Formal Rental (thus the price), but it looks fine to me, with the only evidence of such is some stickers on the front of the manual, which I can try to upgrade if I’m ever so inclined. Pretty neat how it also includes Out of this (Another) World so through both games seamlessly, if you are a masochist. Chuchu Rocket GBA was $10. I love ChuChu on Dreamcast but the multiplayer ruins friendships, so now all my friends are gone and I have to resort to this version. Genesis Game Genie was $5, can’t wait to make weird glitchy codes like I used to with the Super NES Game Genie growing up. 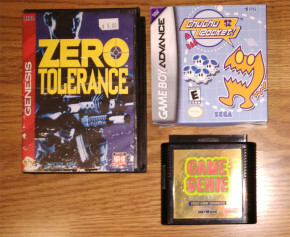 Zero Tolerance was an interesting find, being one of, if not the only, game that uses a system link cable that connects the consoles thru the 2nd player port. Weird! 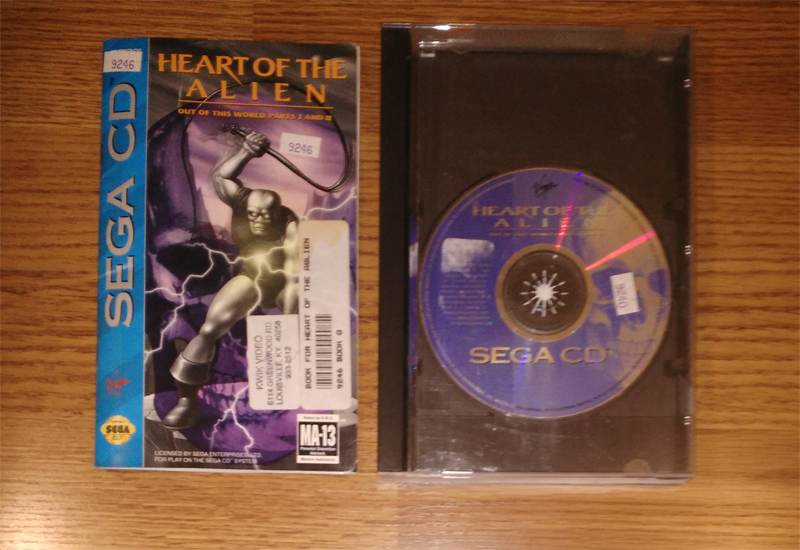 Sega Saturn Imports, for $5 each. Tried to find something that wasn’t released stateside, at least to my knowledge at the moment of searching, and would be relatively English friendly with Tetris S and Togue: King of the Spirits. I’m already biased on Tetris DX being the best Tetris but I’ll try it anyway. It has monkeys on the back insert and manual, so how can you go wrong? 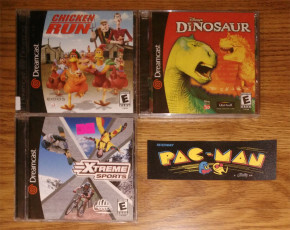 Dreamcast Games and a vinyl Pacman sticker. Chicken Run was $4. Disney’s Dinosaur (Sealed) was $10 and and XTreme Sports was part of a 3 for $10 with two SNES games. Didnt realize that I already had Xtreme Sports, but what can you do. The Pacman sticker was $1, and reminds me of a Pacman ringer shirt I used to have. Simpler times. 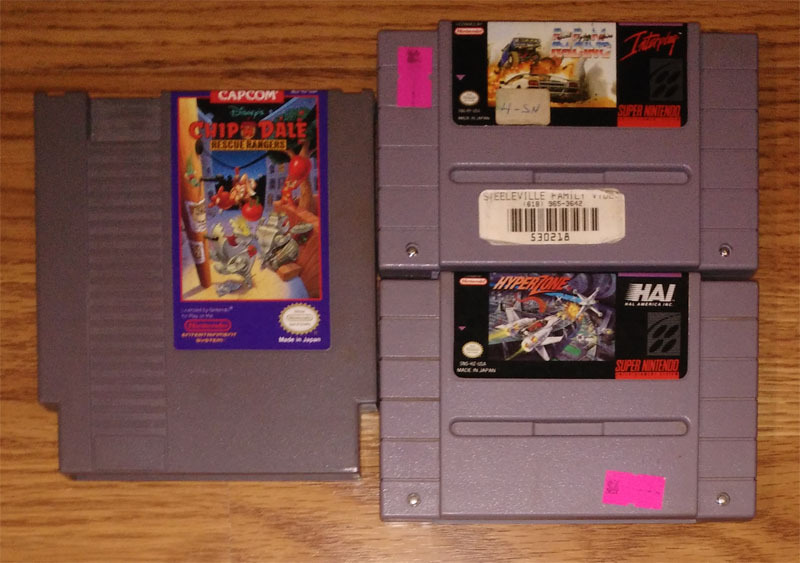 Received NES Game Rescue Rangers in a trade for some VHS tapes and other Goodwill finds from another collector. 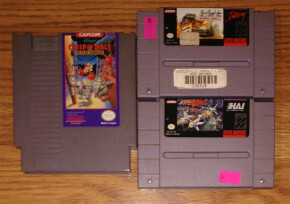 The 2 SNES games, Hyperzone and Radical Psycho Machine Racing were from the rest of the 3 for $10 deal with Xtreme Sports up above. Came for Radical, stayed for the Psycho Machines. Finally, the main focus of my pickups this year was Game Gear, as I’m in the works of designing a Game Gear Console project. 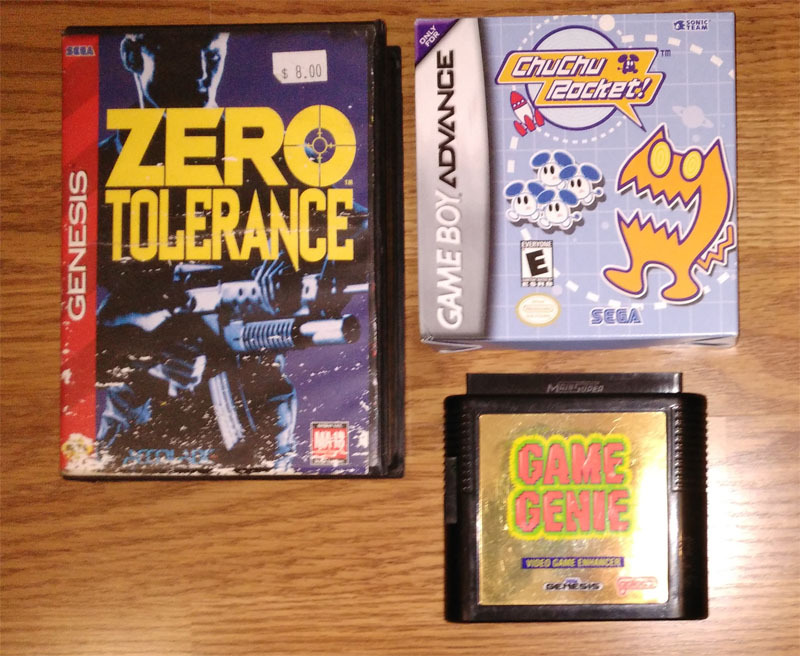 Not a lot of competition for these, and they were all super cheap, just had to slum it though boxes of other loose Gamegear, Gameboy, and other portable console games and accessories. Grabbed 22 in total throughout the weekend; The Addams Family, Aerial Assault, Chuck Rock, Ecco the Dolphin, Garfield Caught in the Act, Kawasaki Super Bike, Legend of Illusion Starring Micky Mouse, The Majors Pro Baseball, Mortal Kombat, Poker Face Paul’s Blackjack, Ren & Stimpy: Quest for the Shaven Yak, Roadrunner: Desert Speedtrap, Sonic 2, Spider-man Return of the Sinister Six, Streets of Rage 2, Super Columns, Super Monaco GP, Taz-Mania, Taz Escape from Mars, Wheel of Fortune, Winter Olympics, and X-Men. 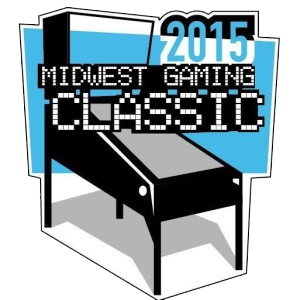 For more MGC content be sure to check out our 2015 show recap coming soon. From the pickups, show displays, vendors, and patrons, MGC is a wonderful time. Already can’t can’t wait for the treasures and excitement that awaits the 2016 show.